Why buy a kids wetsuit for the pool? Seems obvious doesn’t it but people and even loving parent tend to forget that Kids get cold even in heated pools. Even if the pool is heated to the recommended 32 to 34 Deg.C. After all, that's not even close to their body temperature. In some cases, your child may be sensitive to the chemicals in the pool and there is some level of protection in such swim ware. But for the most part, you want your baby to be warm. So let's face it some kids need them. So why would I Hate Kids wetsuits? I don’t per se! But there three things that really irritate me about them: thickness, length and fit. The thicker your kid's wetsuit the warmer they will be. Unfortunately, thickness relates to freedom of movement and difficulty in getting the thing off. You don’t need a deep sea diving uniform in order to do swimming lessons. If you are going to make your children move like a penguin in the pool then they may as well not be in lessons. It is hard enough for the students to learn what they have to learn without losing the ability to move easily. Remember your only going to be in their lesson for a short time; typically ½ to 1 hour. You only need something that will keep them warm for that period of time. If they stay in the water longer than their lesson it’s all bonus but you don’t have to buy anything to keep them warm for more the swimming lesson time. The other problem with thick wetsuits is that they give the swimmer too much buoyancy. A “little” extra buoyancy is not a problem to a beginner swimmer. It can be a great advantage. In fact, a good swim instructor will make good use of it. But too much will interfere. Trying to teach a child to float when their swimming costume makes them do nothing else can be a real pain and doesn’t help your child learn. 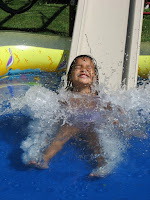 A good measure is if your child can move freely then the buoyancy should not be an issue. I’m a good swimming teacher but if a child is uncomfortable or can’t breathe, even good swimming teachers are going to be annoyed with the parent. Baby wetsuits are a little different. Don’t get baby wetsuits with sleeves or legs it’s a pain to put them on over nappies (diapers). If you keep the core warm of a babies body that’s all you have to worry about. Beside they grow out of fitted wetsuits way too fast and you will have wasted your money. So if you buy a kid's wetsuits online, make sure you follow the size charts and if you buy them offline make sure your children to try them on. Simple really! There are so many articles out there that make it too complicated. So why not do us all a favor buy a kids wetsuit that is designed for the swimming pool then we can all have fun.